Properties FormSyrup Weight270 (gms) Dimensions5.2 (cm) x 5.2 (cm) x 13.9 (cm) FOR TREATMENT OF COUGH INCLUDING WHOOPING COUGH, BRONCHIAL AND OTHER RESPIRATORY PATHWAY, INFECTIONS AND ASTHMA ADEL 83 (BRONCHI-PERTU) syrup is indicated for bronchitis, asthma, whooping cough and other infections of the breathing passageways. It stimulates excretion of toxins that cause symptoms such as a dry cough with stabbing pains and pus, emphysema and headaches. In addition, this medication functions as a natural plant antimicrobial without the side effects. 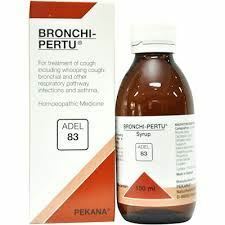 ADEL 83 (BRONCHI-PERTU) syrup also can help patients who suffer from inherited weakness of the local mucous membranes, such as asthmatics and those prone to severe whooping cough. Practitioners must be aware that continuous bronchial infections indicate a serious ongoing intoxification that requires an exact diagnosis and prompt treatment to prevent the eventual development of asthma. For excertion of toxins that cause symptoms such as dry cough with stabbing pains and pus, emphysema and headaches. Bryonia cretica 3X, Dactylpius coccus 2X, Grindelia robusta 8X, Guajacum 3X, Kalium stibyltartaricum 4X, Oenanthe aquatic 4X, Phosphorus 6X, Usnea barbata 12X. Bryonia cretica effectively treats a dry, hard cough accompanied by stabbing chest pains, as well as bronchitis and pneumonia. Dactrylpius coccus contains carminic acid, a non-toxic disinfectant that works extremely well against asthma, bronchitis and whooping cough. It helps calm bronchial conditions that include spastic, suffocating coughs common to asthma. In addition, this herb stimulates the kidneys which are also affected during respiratory illnesses. Grindelia robusta directs its unique healing properties against breathing difficulties such as wheezing, and promotes excretion of mucus that burdens the lungs. It is also indicated for treatment of bronchial and heart asthma, chronic bronchitis and whooping cough in which the patient cannot take in sufficient air while in a prone position. Guajacum addresses pus-producing infectious conditions that afflict the bronchial passageways. This substance also effectively treats acute rheumatism and gout, and eliminates old infections to make systemic healing possible. Kalium stibyltartaricum rejuvenates the metabolism and intestinal tract, which is inevitably affected by respiratory illnesses. It also stimulates excretion of pus and mucus even in severe cases. Oenanthe aquatica complements and boosts the effects of Guajacum officinale to heal bronchial conditions quickly. It is effective in treating bronchitis accompanied by dry, frequent coughs and breathing problems. In addition, it helps eliminate the large amount of morning mucus found in emphysema and TB. Phosphorus possesses properties that help heal infections found in any part of the body, including the eyes, respiratory tract, heart and intestinal tract. 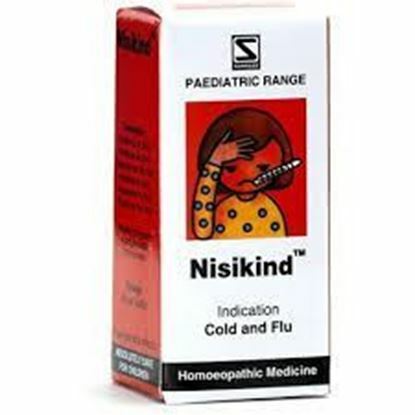 It is effective in treating rhinitis, laryngitis, bronchitis, asthma and all stages of lung afflictions, including whooping cough that has an incubation time of 7-14 days marked by fever, coughing and a runny nose prior to the paroxysmal phase. In addition it plays a considerable role in regulating intestinal processes and addresses emotional exhaustion and depression that may accompany these infections. Usnea barbata resolves congestive headaches that frequently accompany respiratory illnesses such as asthma, bronchitis and whooping cough. It also contains lichen that even at a dilution of 1:500,000 - functions as an effective antibiotic. Furthermore, this plant provides important minerals such as manganese, phosphorus and sulfur.